Colleagues employed with a NAIOP NJ Member's firm, subject to verification. Members of NAIOP NJ Chapter, and employees of Corporate Member firms (firms with four or more members). A limited number of registrations are available to student members at no charge via the NAIOP Scholars Program. To register, contact Barbara Morford at 732-729-9900. Registrants who are not members of NAIOP NJ must pay in advance. Use this form for offline registration & payment. How do tomorrow’s CRE professionals envision the redevelopment of the former Hoffmann-La Roche site? Now being redeveloped by Prism Capital Partners as ON3 (NJ's largest contemplated redevelopment), the property boasts a collection of trophy quality office and research/development buildings aggregating more than 1.2 million square feet, with an infrastructure that has no parallel in the metropolitan region emphasizing sustainability, compliance with LEED standards and redundancy in all essential utility services. Experience this unique property yourself, and hear from teams from Monmouth, Rutgers and Villanova. Converge: Join your CRE colleagues on April 4 at ON3, the in-progress transformation of the former Hoffmann-La Roche campus in Nutley & Clifton. Connect: Make and renew connections over cocktails & a buffet dinner. Converse: You'll be buzzing about the creative visions offered by teams from Rutgers, Monmouth and Villanova Universities. Come out and root for your favorite school! The program will include remarks from Prism's Gene Diaz, Nutley Mayor Joseph Scarpelli, Clifton Mayor James Anzaldi, the student team presentations, and the awarding of a $5,000 check to the winning team. 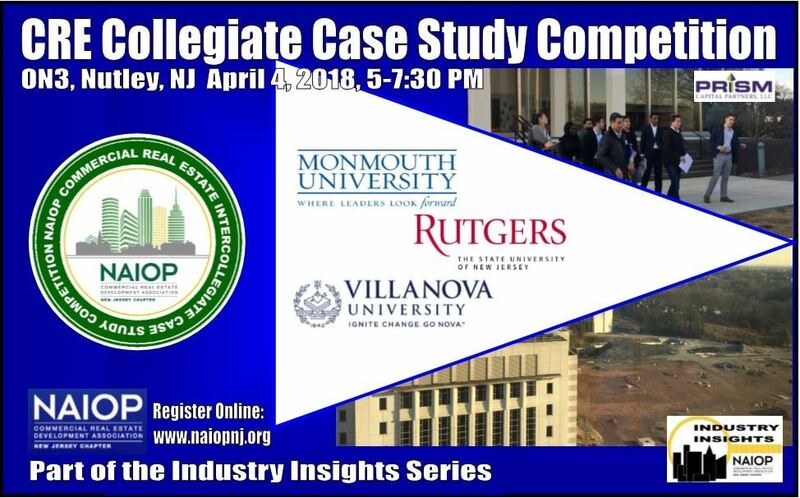 The CRE Collegiate Case Study Competition dinner is part of NAIOP NJ's Industry Insights Series. NAIOP thanks our Platinum Master Sponsors (Prologis, Elberon Development Group, NAI James E. Hanson, Melick-Tully a division of GZA), Gold Master Sponsors Cushman & Wakefield and Sax LLP, and CREICS Competition Sponsors Prism Capital Partners and Gensler. Directions and parking information will be sent to all registrants. Directions & Parking: Set your navigation to 340 Kingsland Street, 07710. Proceed through the gated entrance and look for the Valet Parking in front of the building.